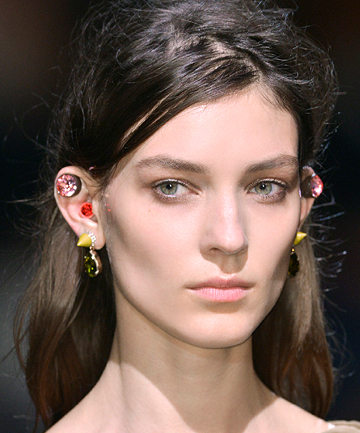 Now trending: Multiple ear piercings. A far cry from the punk vibes of yesteryear, the latest crop of multiple ear piercings manages to be at once feminine and rebellious. Bespoke piercers like Brian Keith Thompson, owner of Body Electric Tattoo in Los Angeles, consider his clients' personal style, daily jewelry habits, skin tone and even eye color before designing a custom look. The result: stunning, delicate designs that are one-of-a-kind. These covet-worthy ear piercings instantly elevate your look, and give you major trendsetter vibes. Prepare to be inspired (and start frantically searching Yelp for the best bespoke piercer in your area). It's time to upgrade the single lobe piercing you've been rocking since childhood.